yrh draw through all 4 loops. Pattern Row - 2ch, 1htr into each htr to end, 1htr into top of 2ch. Turn. Rpt last row until 80 rows have been worked in all or work measures approx 26 inches from beginning. Turn. Working into back loop of dc only for this row, work Pattern Row once. Turn. Working through both loops of stitch from now on work Pattern Row eleven more times. Turn. Next Row - 1ch, 1dc into base of 1ch, 1dc into each st to end, 1dc into top of 2ch. Turn. Repeat last row once. Turn. Decorative Edge - * 3ch, tr3tog (see abbrev) into next dc, 3ch, ss into each of next 2dc, * rpt from * to * to end. Fasten off. Using 5.00mm hook, rejoin yarn to left corner, (pic 2) make 1ch, 1dc into base of 1ch, working into row ends and catching in fold over as you go, work 83dc evenly along down first side of blanket to corner, 3dc into corner, work 1dc into each ch along cast on edge to corner, 3dc into corner, working into row ends, work 83dc evenly along up second side of blanket to corner catching in fold over same as first side. Turn. Starting with 1ch, work 1 more row of 1dc into each dc, down first side, along bottom and up second side, w orking 3dc into corners. Turn. Decorative Edge - * 3ch, tr3tog into next dc, 3ch, ss into each of next 2dc, * rpt from * to * around all three sides of blanket. Fasten off. Flower Motif x 2 - (Worked in rounds without turning) With 5.00mm hook and green coloured yarn make 4ch, ss to first ch to make a ring, 1ch, work 9dc into ring, ss to first dc. Fasten off. 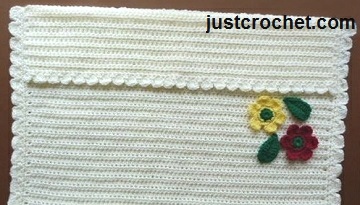 Finishing - Sew in and tie off loose ends of yarn, sew flowers and leaf/es randomly to blanket.